Recently, as our listeners will know, the new administration in Ontario, Canada, announced that they will cancel the ongoing basic income trials there. In response, Jessie Golem, a photographer and basic income recipient, started a project called Humans of Basic Income (@HumansBasic on Twitter). Golem takes portraits of other basic income recipients in Ontario holding up handwritten signs describing what basic income has meant to them. The project both humanizes the basic income program and argues for it to continue. Jim spoke with Jessie Golem about the Ontario program and the Humans of Basic Income project. Owen: Recently, as listeners of this podcast will know, the Ontario Basic Income trials– there was announcement that they would be canceled. Now as of now, we have no details about when or how that’s going to happen, and so the recipients of basic income are pretty much left in limbo, wondering if they’re going to get their payment next month, next year, and so on. Since the announcement, a photographer, named Jessie Golem, started a project called Humans of Basic Income, in which she takes photos of basic income recipients in Ontario holding up a sign with a sentence or two about what basic income has meant to them. Since then, the project has completely taken off. Jim: I had a chance to sit down with Jessie and talk to her about her experiences with this project and where she sees it going. 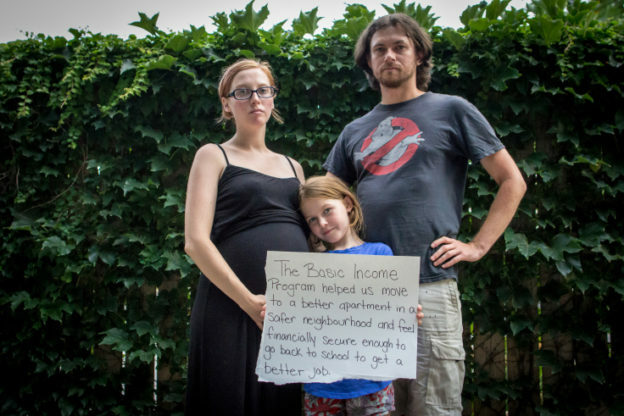 Owen: Here’s Jim and Jessie Golem on the Basic Income Podcast. Jim: Jessie, thanks so much for joining us on the podcast. Jim: Now, you run the Humans of Basic Income project, which is telling stories of participants in the Ontario Basic Income Pilot. Beyond that, you’re actually enrolled in the program yourself, correct? Jessie: Yes, that is correct. Jim: Can you tell us a bit about what your experience has been before and during the pilot? Jessie: Yes, I worked four jobs before signing up for the pilot. I signed up in December, and I found out I got approved in February. I was working four jobs. It’s basically like I was up early in the morning and just working nonstop between all of my jobs and not really having time to make meals for myself or I’m just going home just to sleep and shower and that’s it and nothing else. It was just a very, very exhausting and frustrating existence. I was also finding that I was still just barely scraping by and still living paycheck to paycheck, but still feeling like I didn’t have time and the opportunity to pursue the things I want to do or focus my energies into the jobs I want to be doing. When I got basic income, I dropped down from four jobs to two jobs. Those two jobs was on both building and managing my own business as a freelance photographer, so advertising, booking photo projects, doing the thing I love, and also I’m the operations manager at Photographers Without Borders. That’s a rapidly growing organization and in itself, it is a full-time job. It needs the energy and time to devote to it and basic income was buying me that energy and time to devote to growing PWB. Jim: Wow. That sounds like exciting stuff. It would be a very positive shift to be able to really focus your energies in that way. As I think all of our listeners know, last month, the new Progressive Conservative Government of Ontario announced that they were canceling the pilot, despite having promised that they would not do so during the election. Jim: What was your reaction to that? Jessie: I was devastated. Before the pilot had gotten canceled, there’s actually a series that the Huffington Post is putting out called No Strings Attached, where they were following a couple of different people in Ontario on the Basic Income Pilot, and I was actually one of the subjects that they were going to be following. They produced a number of videos. One of the videos is out already, it’s really good. It’s about this couple in Lindsay that started their own business, and they hadn’t done my video yet. I was literally– an hour before they made the cancellation, I was talking on Facebook with the editor at Huffington Post about planning the video and having the shoot ready and what we were going to do. Literally, an hour later, she messaged me and said, “They’re winding down the program. I’m really sorry,” and I felt like the rug was just pulled out from underneath me, and I was devastated and furious. My dad called me later that day because he found out and he was like, “Jessie, just be calm.” I just started crying because I was just so upset and so angry. I realized that I have this relationship with Huffington and I have a platform and I have this ability. I’m not going down without a fight. I want Doug Ford to know my name, and I want him to know how angry I am. I wrote an opinion piece for Huffington Post. I did a number of radio interviews. Then I started contacting people in my city, which is Hamilton. I went to Hamilton Roundtable for Poverty Reduction, and they ended up going to Queen’s Park where I participated in a press conference there. Somewhere along that line, I got the idea for the portrait series. This was both inspired by my work at Photographers Without Borders because our big mandate is amplifying people’s voices and using the power of visual storytelling to communicate change. I recognize here that my story is just one story but there are 3,999 other stories out there of people who were using basic income to get themselves out of poverty or start new careers or go back to school or move into safer living or like so many really, really good things that would contribute to our society in a positive way. I realized I could tell those stories. Then, I just started reaching out on social media, putting call-outs on community groups on Facebook and everything. As soon as I got a couple of portraits started and people could start to see what I was doing and see the vision of what I was doing, that’s when the ball started rolling. More people kept on coming forward to me and wanting to get their portrait taken. I would set up times where I would meet up with a group of people and take all their portraits or go to their places and meet them personally and take their portraits. It’s just kinda gotten the ball rolling from there and the momentum has been growing. From there, I shared it on my personal Facebook, and then one of my friends got the idea of doing social media. We created a Facebook page and a Twitter account. I’ve been posting all the pictures on there and telling all these stories. The impact has been tremendous. It’s really taken a life of its own. It’s grown beyond me, which is beautiful to see. Jim: I think, so often when you hear public conversations around basic income, it tends to be more mired in the economics and larger systemic view of things. Jessie: We’re directly negatively affected by this cancellation because they had plans. There were people I’ve met who have had three-year plans that were going to use this money to do this, that, or the other, but now, those plans are suddenly canceled. The other thing I need to point out is that the Conservative government hasn’t communicated anything to anyone. Like I said, I found out because of the editor of Huffington Post told me. Nobody got any letter in the mail, nobody got an email or a phone call, nothing. Nobody knows what this looks like moving forward. When they say that– the Conservative government keeps on saying that they’re going to do a compassionate wind-down but leaving 4,000 people completely in the dark wondering, “Am I going to get money this month? I don’t know.” They’re terrified because they’re depending on it. It’s not compassionate, it’s evil. It’s horrible. Jim: It’s almost the exact opposite, going from actually full security to suddenly complete insecurity as to where your life will be in a week or a month. Jessie: Yes, exactly, and not giving anybody any adequate time to plan for what happens next. I know for myself, I haven’t had a moment to think about what is plan B. I haven’t thought about plan B yet, and partly because I’ve been so busy doing this portrait series, but I also think emotionally for me, part of doing the portrait series is avoiding having to think about plan B and think about the reality that the Conservative government has forced me into. Jim: Now, as you’ve talked to other basic income recipients, have there been things that have stood out in your conversations? Anything that surprised you or seemed particularly noteworthy? Jessie: Yes, it’s honestly been one of the most heartbreaking photo series I have ever done. Everybody I have talked to has all expressed about the sense of helplessness and fury about what’s happened and like, “Well, what can we do now? We can’t speak up.” When I’m coming to them and saying, “Hold this sign. Write your story on it,” it’s giving them a voice. People have been really thankful that I’ve been coming to them. I had one encounter that was particularly heartbreaking. It was an older gentleman and after I took his picture, he just– a few minutes, I was working with some other people getting their portraits, and he just shuffled up to me, and he was like, “Jesse, I have a question. I’m really afraid of the answer.” He looks genuinely afraid. There’s this older man fellow talking to me, and then he’s like, “Am I going to get this month’s payments?” Just that kind of fear and that really struck me because I was just like, “Wow, we’re all in the same boat.” I had to look at him and say, “I think we are, but I don’t know.” To have to say that to him was really, really heartbreaking. There were other people. Actually, a person who– actually, outside of all this, she’s a very good friend of mine. She was studying. She’s going to school for manual therapy and osteopathy, but she’s also working as a bartender. It’s like she’s working all night and closing up bars and then waking bright and early and going to school all week. To have to return to that life is going to be exhausting for her. I also know another person I met is living in a motel. She is washing her dishes out of her bathroom sink and doesn’t have– it’s just not an adequate living situation whatsoever. Jim: Wow. That is intense. Jessie: To see that and to be encountered like this is, this is what poverty in Canada looks like. This had an opportunity to get this small group of people out of poverty, and you’re just taking it away without any– any of the reasons that they are using to justify doesn’t have any research or citation to back it up. There isn’t actually a reason, and they aren’t providing us any information. Jim: Now, I realized that you may not have had a whole lot of time to figure this out. I’m curious, do you have a sense at this point as to where you hope this project will go in the shorter and maybe longer term? Jessie: I’m hoping that it changes public opinion. I’m hoping that in the long term, it opens up a very real conversation about poverty and the stigma around poverty. A big thing I’ve noticed especially advocating for basic income and doing this project is that there’s a lot of very dehumanizing vernacular when it comes to talking about people in poverty. People have called me a parasite or a leech or saying that I’m stealing taxpayers’ money. That kind of language, it’s dehumanizing in a sense that you aren’t a human, you’re a parasite, you’re a leech, and your humanity is only dependent on your ability to economically contribute to the society. I’m hoping by bringing these stories forward and saying, “These people are working. I am working. I’m managing a rapidly growing international not-for-profit.” I’d like to think that the work I’m doing is good and justifiable work. Other people are working and were using this to better their lives. They aren’t using it as an excuse to be lazy or sit around and play video games all day or whatever it is. It was an opportunity, not an excuse to build and better their lives. I’m hoping that helps to change the stigma and change the conversation because especially in these times when we have people like Doug Ford or Donald Trump in positions of power that utilize tactics of fear and misinformation and ignorance and propaganda to further their agendas, I feel like that kind of vernacular is very divisive and polarizing and can be very dangerous in the long run, and very violent. I want to be able to shift away from that. Another goal of this is obviously, to get the pilot back or to get some sort of remuneration or compensation for the damages that are caused. I am working with people in Thunder Bay, Lindsay, and Hamilton in discussions about what a class action lawsuit would look like, which actually one was just filed yesterday by four people in the city of Lindsay. We’re looking at that and also trying to put pressure both on the government, on the Conservative government so that this is widely denounced as a very bad and very unpopular move to bring it back or to see if the federal government would take up the project, which would be in everybody’s best interest. Jim: I’ve been still impressed to see how much is happening there in response to that announcement. We had a chance to talk with Sheila Regehr a couple of weeks back, and she was talking about some of the things is in her work. That seems like a really big deal. There’s actually legal actions that’s moving ahead now as well. Those were all the questions I had for you. Is there anything else you’d like to add? I’m seeing it happen right now with the exposure that it is getting and all of the attention that it is getting. I do feel cautiously optimistic for a positive outcome for this. Again, it is all about amplifying voices and the power of storytelling to create change. It’s been a huge blessing for me to be in a position to be able to amplify these voices and tell these stories in a platform where people are listening. Owen: That was Jim Pugh and Jessie Golem on the Basic Income Podcast. Jim: I would say Ontario is a fairly rare instance in the UBI space where just generally, we’re seeing more of the human side of basic income, because you’ve actually had recipients. And just seeing the pushback that’s come from there, I think that it has just broadly felt like there is– it’s more of a people issue. But I think with Jessie’s project, that’s just being taken to next level. Like you’re actually seeing these first-hand accounts of how people’s lives were actually changed and what it will mean to them if this program was canceled. I think as we’ve talked about many times before, it’s hard to overstate what impact these sorts of stories I think could have on the basic income debate going forward. Owen: Yes, it’s really true. I think when you have a program where it’s like, “We built a school, and we created a mentorship program,” and so on and so forth, that basically creates a story in your head without any more details. Or if you just say we gave someone money that feels like the first sentence, and we don’t know what happens after that, but you know Jessie’s project is showing what happens after that. It’s a lot of very uplifting results and hopefully, it can keep on. Jim: I’m very curious to see as this grows, how elected officials are going to react if there is the potential that they may change their mind and particularly with this lawsuit as well. It seems like there are efforts from all fronts, so hopefully, they are able to change what happens. I’m also curious to see over the longer term how this affects the ways that different organizations decide to engage around basic income. Certainly, in the US, my sense in Canada as well is there has been or at least had been still a lot of skepticism around the idea of unconditional cash and that it wasn’t necessarily a good way to support people. Now that we have these stories out there, it’ll be really interesting to see if folks there change their mind as well. Owen: This makes it very intuitive. Jim: Absolutely. As Jessie said, if folks want to be supporting now, a great way to do this is to be sharing new stories because they are being posted online. You can be sharing them on your social media as well, sending them to friends. If you’re not already, you can follow Humans of Basic Income on Twitter. It’s @HumansBasic, all one word, and see what stories have been posted and help get those stories out there. Owen: Alright, that’ll do it for this episode of the Basic Income Podcast. Thank you to our producer, Erick Davidson. Please rate and review us on Apple Podcast or the service of your choice and subscribe while you’re there if you’re not already. And tell your friends; we are always looking to bring more people into this conversation. We’ll talk to you next week. This entry was posted in and tagged basic income, basic income ontario, basic income podcast, humans of basic income, ontario, ubi, ubi ontario, ubi podcast on September 5, 2018 by owenpoindexter@gmail.com.